I quilted four Community Quilts on my quilting retreat weekend last weekend. I didn’t keep track of the threads I used, so unlike the others I’ve documented, you won’t get thread choices in these posts. Unlike most of the quilts I’ve quilted for the Community Quilts program, I did NOT like this quilt. 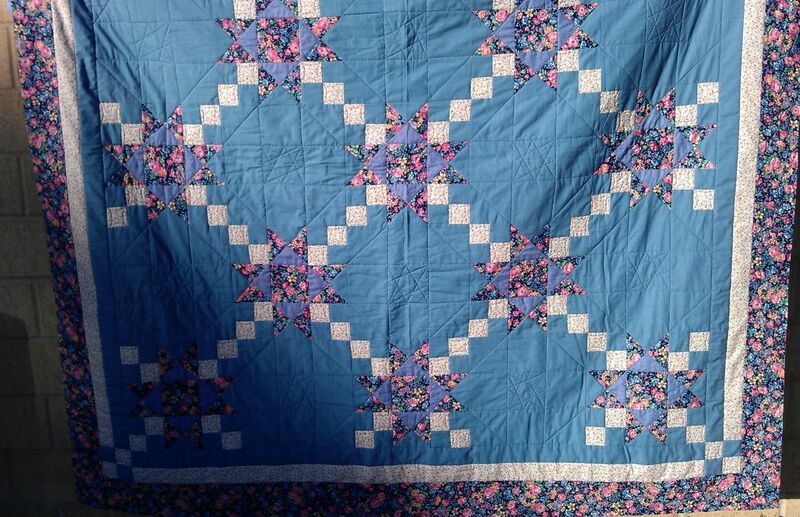 I didn’t like the colours, the fabrics used, or the size of it (it was HUGE), though I didn’t mind the backing fabric 😉 The plain blue fabric used on much of this quilt just didn’t match (in my eye, at least) the other colours used, and I suspect it was old sheeting or old fabric from someone’s stash. The size of the quilt made it a real pain to move around, and, as I was away from home, I didn’t have my improvised bungee cord system to help prevent drag and hold up the quilt, so my shoulders were really aching by the time I finished it. To avoid looking at that horrible blue for too long, I took the advice of one of my quilting buddies (none of whom liked this quilt’s colours either!) and just did a simple straight line motif to hold the layers together. 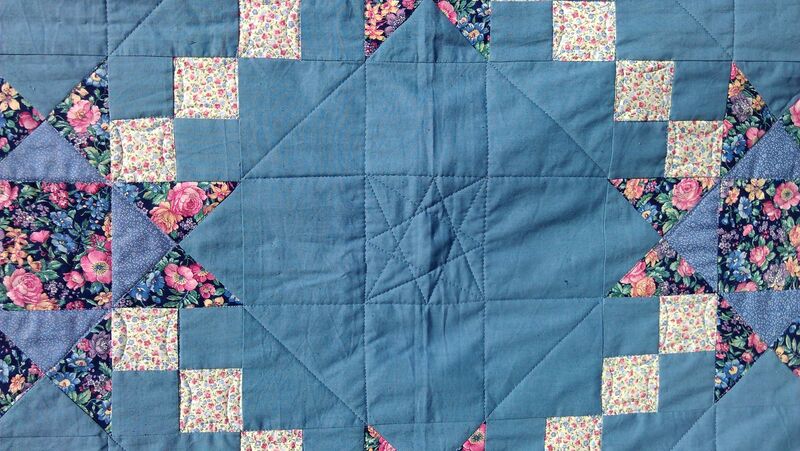 I started by stitching in the ditch around each star and the blocks making up each star and the joining squares. Then I used my Line Tamer ruler to stitch straight lines joining the points of the stars to each other, then to create a ‘wonky’ star in the centre of each of the expanses of blue fabric. In the border, I did a large meandering stipple. I was glad when it was done and I could fold it up. Sometimes ya just do what you have to do!!! It is nice, though! Does the bungee system make that much of a difference? 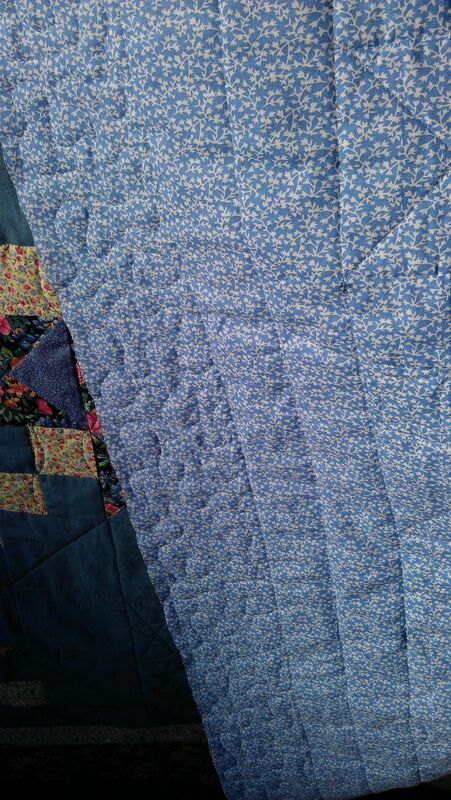 I think it is a nice quilt too. Will keep several people warm – haha. I didn’t think it would, Dawn, but my shoulders were killing me by the end of this quilt. In fact, I didn’t quilt for another two weeks after that weekend as my shoulders were so sore. I quilted another big quilt yesterday using the bungee system, and while I had a twinge of shoulder pain (underlying pain still from that weekend), it would’ve been much worse had I not used my bungee system. So, yes, it DOES make a big difference in fighting the quilt when it wants to fall off the edges the table (I have the two extension tables too, so it’s a big quilt if it falls off the extended table; I took the extensions with me for my weekend away, so the only difference between away and home was the bungee system).